Slotland added another new video poker game this week. 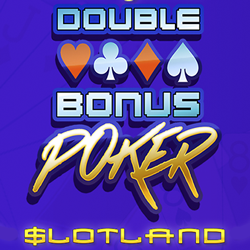 The new Double Bonus Poker video poker game is a variation of Jacks or Better with a higher payout for four-of-a-kind, especially four Aces. Until May 16, you can get a $10 Freebie and 30% deposit bonus to try the new game. With increased wins for all four-of-a-kind hands and big payouts on four-of-a-kind Aces, Double Bonus video poker rivals Jacks or Better video poker in popularity with video poker players. The variance is also double Jacks or Better, so it's more volatile. There's bigger ups and downs. Both bonuses are valid May 11 – 16, 2016 only. To begin play in Double Bonus Poker players first choose how many coins to wager. With coins valued at $.10 to $5 each, a minimum one coin bet is just a dime and the max bet is $25 per hand. To build the best poker hand possible, they can hold up to five cards in the next deal. A Royal Flush is the highest paying hand with a payout of 800X when a max bet has been placed. After any win that’s more than the bet, players take their winnings or take a chance to double them. In the Double Up round, they’re dealt five cards, one face up and the others face down. After selecting a card, all of the cards are turned over. If they’ve picked the highest card, their win is doubled. A pioneer in real money online slots for more than 17 years, Slotland now has 40 unique casino games, most compatible with Apple and Android phones and tablets.